Windows 8 Developer Preview, which has been made available for download today, comes as an ISO file and can be installed and tested with Virtualbox to avoid harming your computer. But if you’re too lazy even to try a new operating system in a virtual environment, here’s a collection of screenshots we’ve taken while testing Windows 8 . 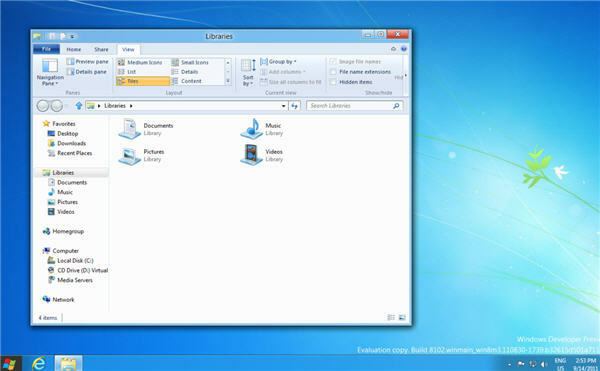 The Metro interface (pictured above) is the most significant feature in the new version of Windows. But there are undoubtedly other highlights in Microsoft’s next operating system. 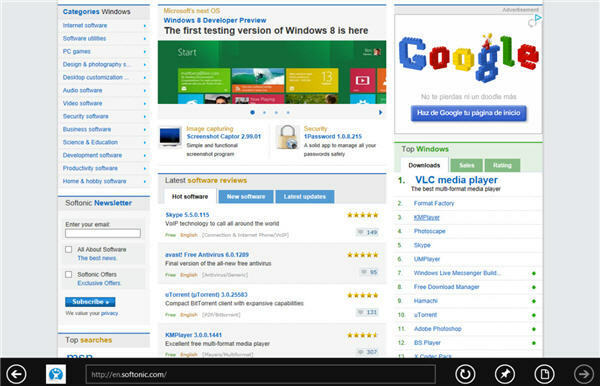 Internet Explorer, for example, changes a lot under the Metro design. You can tell it’s been developed with a touchscreen in mind – like most of Windows 8. 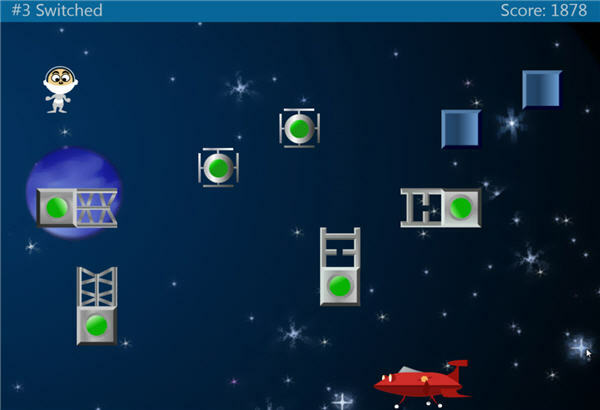 The Control Panel has also been totally revamped. The interface is divided into two main areas, with the panel options listed on the left side and the contents of the selected option displayed on the right side. It’s all very clean, with large fonts and lots of space. The Windows Manager, as we saw before, has adopted the Ribbon interface. Besides that, it remains pretty much the same as previous versions of Windows. This Developer Preview is quite limited in terms of functionality and tools. All you get, besides Internet Explorer, is a pack of system utilities and a bunch of games. Regarding the first, here’s Inkpad, a notepad where you can actually write – not type. Again, touchscreen-based design. 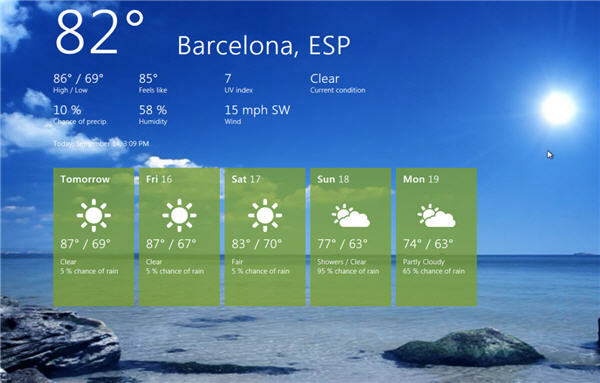 Another system utility: the Weather app, which looks really nice in glorious full screen and featuring an animated beach as background image (yes, it’s quite hot in Barcelona these days). 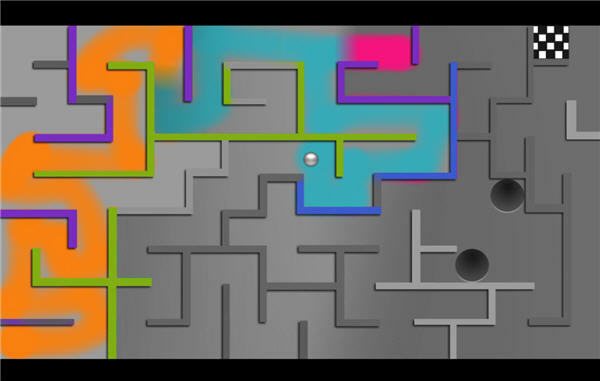 As for games, like I said, there are quite a few: Labyrinth, Zero Gravity, even Sudoku! 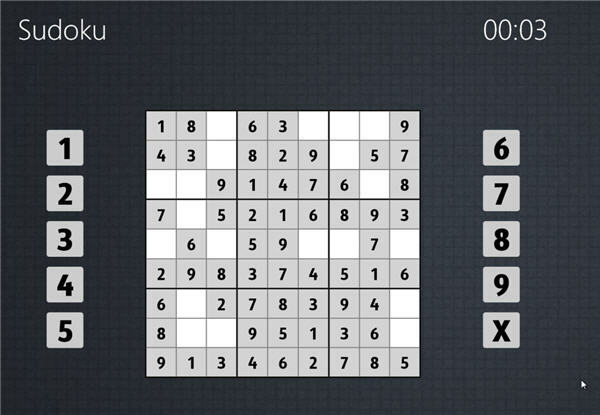 I couldn’t find any trace of Minesweeper or Solitaire, though. 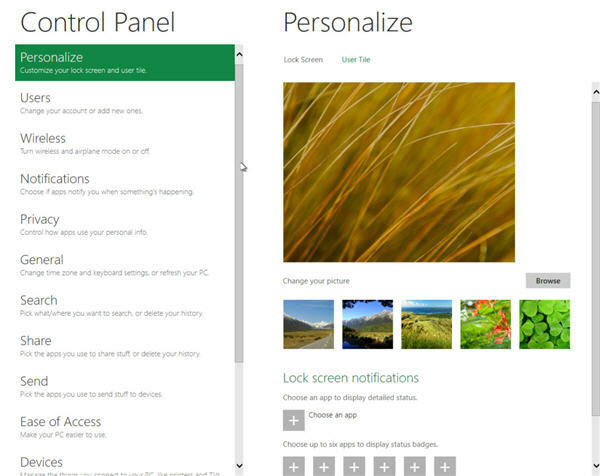 Besides games, Windows 8 also includes a couple of built-in social apps. One is Socialite, which you can link with your Facebook account to keep up with your friends, see their latest photos, post updates and more. And if you have Facebook on Windows 8, of course you also have Twitter. 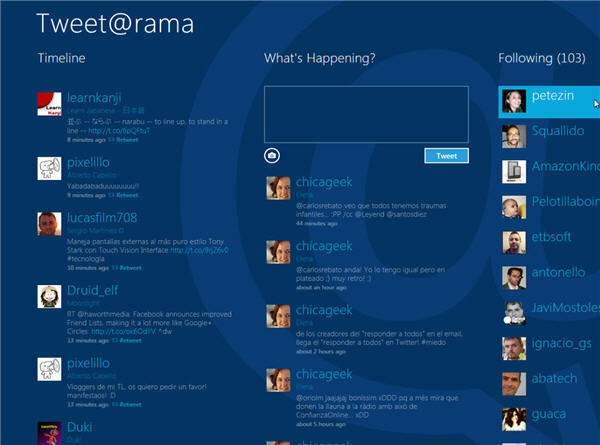 Tweet@rama is the uilt-in app to access your Twitter timeline, update your status and check what your tweeps are up to. Finally, we clicked the Windows Store logo on the Metro interface, willing to see how the Windows software store looked like, only to get this disappointing message. Looks like we’ll have to wait a bit more to see that happen. 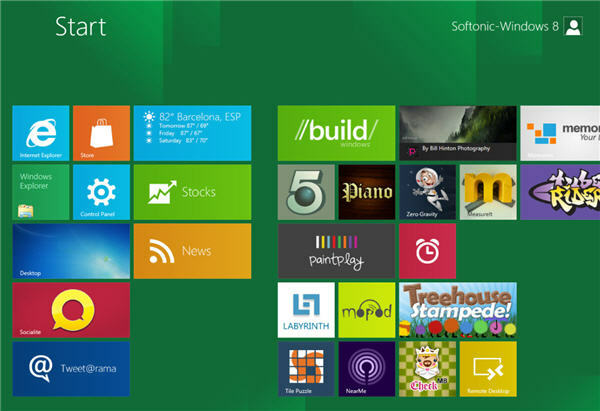 Summing up, Windows 8 is weird, attractive, original, confusing and challenging, all the same time. It’s very different from all the Windows versions you’ve seen so far. It requires users to change the way they interact with the OS, to learn new paths and try new options. After testing the Developer Preview, you can’t help getting the impression that it’s designed for tablets, not for desktop computers. Also, this preview is quite limited in terms of menus and configuration options, and definitely not for daily usage. But if your ‘early adopter’ soul can’t wait, here’s a good opportunity to see what the future Windows looks like. Don’t hesitate to share your thoughts in comments!